« Ticket to Ride United Kingdom available in stores! In Five Tribes Solo, you play the game as usual, using the same actions, but against a dummy player whose actions directly affect your decisions. As you progress through the game, you will discover that time is against you, and each move can be a critical one. Do not worry if you lose your first games… as they say, Naqala wasn’t made in a day! This entry was posted on Monday, December 28th, 2015 at 16:19 and is filed under Big Adventure Games, Events, Games, News. You can follow any responses to this entry through the RSS 2.0 feed. Both comments and pings are currently closed. Unable to download Five Tribes Solo Free. Please give specific instructions. 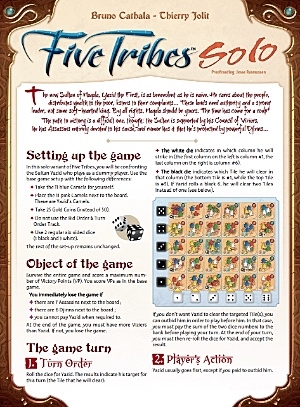 “Download Five Tribes Solo” button did not take me to a download. I am also not able to download the game. It says to click on this link to download and just goes to a page where you can download the rules or a card but no such game seems to exist. Looks fun, sounds cool, & got reminded of how great your games are. Keep up the good work on creating new wonderful games. Sad wasn’t able to get this gift but thanks anyways. you can just download the rules. All you need extra are two dice. It works even with one dice, then you just take your first roll to choose the column and the second roll to choose the row where you have to remove the meeples. The changes in the Djinn’s are explained in the rule book. Nice game, although much harder than it looks. For new players it can be a bit frustrating. The problem is that the rules can’t be downloaded. I am using IE on Windows 10.